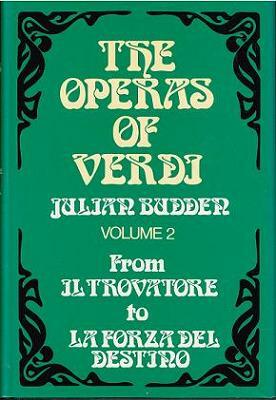 "The three volumes of studies of Verdi's operas by Julian Budden are rightly classics of the genre. This is owing to their scope of information on the genesis, circumstances, variants, and specifics of the operas themselves--certainly the fullest description these works have ever been given--as well as to the wealth of surrounding information about the composer, his life, his friends, and his times. It is a measure of the excellence of Budden's achievement that this cornucopia of information is surveyed in very readable prose--readers get a picture of each work within its context. Budden's knowledge of 19th-century opera--both in Italy and in France--is wide-ranging, and he is able to place Verdi and his works in comparison with those of Donizetti, Pacini, Mercadante, and Meyerbeer. He discusses how the great operatic genius emerged from the background of early-19th-century opera and how Verdi's own early, uneven works blossomed into the glory of his later ones. Budden, thankfully, is not a hagiographer, and he recognizes Verdi's faults as well as his strengths, but few--if any--writers have managed to demonstrate how Verdi both blended in with his musical surroundings and stood out from them. These studies, with all their richness, are a good source of information about a host of lesser composers of the time. Budden includes many musical examples to highlight his writing in this, a work of scholarship of the highest order. 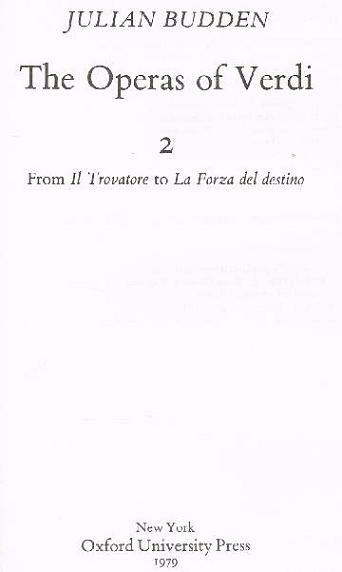 Volume Two covers those works written during the decadence of the post-Rossini period. During this time, Verdi, having exhausted the vein of simple lyricism to be found in Il Trovatore and La Traviata, achieved self-renewal in direct confrontation with the masters of the Paris Opera with his Les Vêpres Siciliennes. A new scale and variety of musical thought can be sensed in the Italian operas that follow, culminating in La Forza del Destino."